Power Fasteners Hollow-Set Dropin™ Internally threaded expansion anchor has zamac alloy construction for high strength and durability. It has internal threading for easy installations. 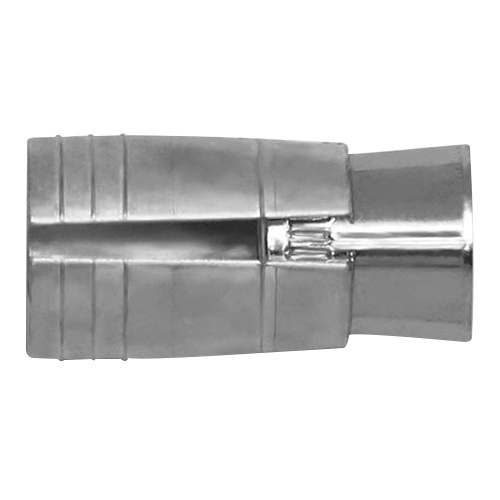 This 7/8-Inch anchor with 1/4-Inch size, has a drill size of 3/8-Inch and screw size of 5/8-Inch. The unique design provides anchoring in thin-walled base materials such as hollow concrete block and precast hollow core plank. It is suitable for anchoring to concrete block, fastening to precast hollow core plank, suspending conduit, fire sprinkler, cable trays and strut, suspended lighting, pipe supports and removable anchorage. The anchor meets AISI C 1008, ASTM B633, SC1 and Type III (Fe/Zn 5) standards.